A convenient way to store your fittings, tools, and small parts! ORGANIZE EVERYTHING! 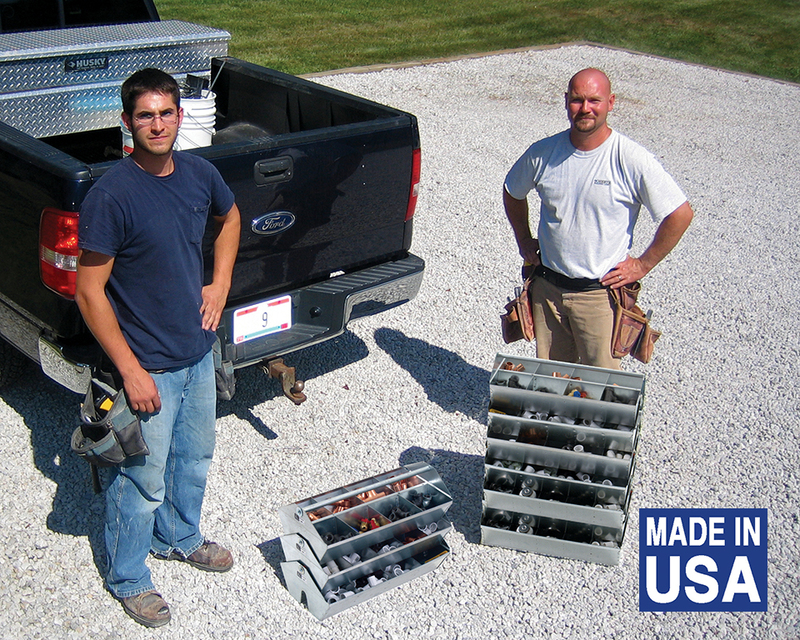 — Our patented, space saving STAK-N-TOTE® — with five different compartment layouts — are ideal for organizing, storing and transporting small parts, fittings, screws, nuts, bolts, tools, and more while at the same time taking up less space in your warehouse, truck, or shop. LOCATE – ACCESS – TRANSPORT —- FAST! — See all your parts at a glance without having to un-stack each tray — each Stak-N-Tote’s angled sides allows you to see and access all your stored items. And each tote has a built-in handle, which provides easy lifting and transport on the job site. DURABLE! — Premium-grade galvanized steel is strong, sturdy, and corrosion-resistant — and outlasts plastic trays. Load capacity = 50 lbs. Made in the USA. MB78000	 Stak-N-Tote®, 5/5 layout, 11" x 20"
MB78010	 Stak-N-Tote®, 4/4 layout, 11" x 20"
MB78030	 Stak-N-Tote®, 3/3 layout, 11" x 20"
MB78040	 Stak-N-Tote®, 4/1 layout, 11" x 20"